MMX was updated to Version 1.50! We just released Windsurfing MMX Version 1.50! In this release, the bottom turn animation was enhanced. Moreover, the scoring system was revised, because it was too much oriented jump. 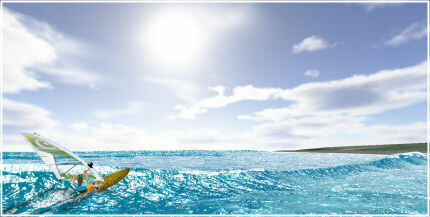 Therefore, jumps like Table-Top, Backloop, Push and Push-To-Frontloop were reduced to bring more focus on wave surfing. Also the slalom boards have more manoeuvrability now, making them more competitive during slalom races. The Network gaming system was also modified, spectators can now watch other players individually. Read more on this update inside the Release notes! To install the update, download and run the “Installer Update 1.50” in the download section. Download MMX Version 1.44 now! Following the implementation of online multiplayer gaming, Windsurfing MMX Version 1.44 had to be released quickly, and is now available for download! This version corrects many bugs that could be detected thanks to your help and big online sessions, thanks a lot for your great feedback! Now the development team can concentrate on new features for the next release! To install the update, download and run the “Installer Update 1.44” in the download section. MMX Version 1.42 is Available! 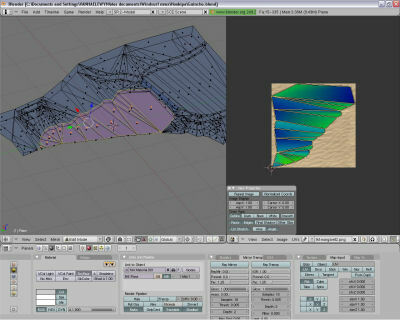 We just released Windsurfing MMX Version 1.42 now available for download! This version adds online multiplayer gaming, up to 20 players can sail and compete together, plus 20 spectators to enjoy the show. A chat is also included (use the ENTER key to use it) and you can subscribe your email address to receive notifications when someone created a new server and waits for players to sail with! Alternatively, you can use the new FORUM section created to set up meetings or talk about anything related to network gaming. So download this version now and join us for some awesome multiplayer competition! To install the update, download and run the “Installer Update 1.42” in the download section. Installer Includes Full Custom Content! 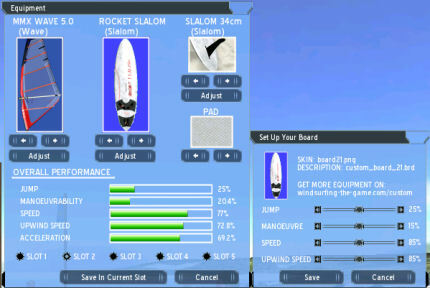 We just created an installer including all boards, sails, locations and fins created by the users. Some of you asked for an installer that includes all of the currently available locations, boards, sails and fins from the custom section, pointing out that clicking through all installers could be quite a pain in the a**. Well, now it was made available inside the custom section, and will be updated every time new contents is released! Windsurfing MMX Version 1.41 was just released! New is also the possibility to switch to a dynamic “beach view” camera which detects your surf session and sets itself automatically to this view angle. Moreover, score submission can now be set to automatic, removing the necessity to clic the submit button at the end of a race or heat. To install the update, download and run the “Installer Update 1.41” in the download section. Version 1.40 ready for Download! We just released Windsurfing MMX Version 1.40! It is also now opened to custom equipment, so many new boards, sails and fins will be available for download inside the custom section! If you wish to share your own creation, follow the steps described inside this section and send us your skins, we will make them available for everybody! To install the update, download and run the “Installer 1.40” in the download section. User “Windsurferdu77” just finished creating this beautiful location (Version 1.0), enjoy virtual windsurfing on the Mecca of the Windsurf World! Congratulations to him, it really is a great piece of work. Moreover, the author is planning to bring some updates in the future, so stay tuned! Windsurfing MMX: The Official Trailer! Some would say better late than never, but at last we took some time to produce the Official Trailer of the Game! It is located inside the screenshots section, have a look and enjoy!